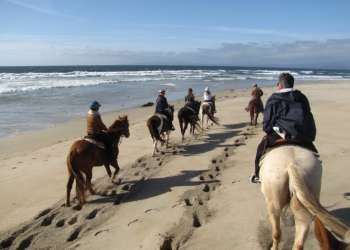 With so many wonderful things to do in Monterey County, it&apos;s almost impossible to choose! This highlights itinerary will take you to the region&apos;s most popular locations and attractions, giving you just a taste of what makes this area so special. Once you&apos;ve checked into your hotel, head to downtown Monterey near Old Fisherman&apos;s Wharf. Your Monterey County orientation begins with a tour on the Monterey Movie Tours motorcoach. This unique tour shows off both Monterey&apos;s most remarkable scenery and its cinematic history. As you drive by Monterey&apos;s most notable scenic spots and along legendary 17-Mile Drive, monitors on board the bus will show the locations as they have appeared in films throughout the years. Welcome back to downtown Monterey! Stretch your legs with a stroll down the Monterey Bay Coastal Recreation Trail to Cannery Row. As you walk along the coast, you&apos;ll see colossal sand dunes standing across the bay along the coastline of Marina, Seaside and Sand City, perfect for exploring on your next visit to the area. You&apos;ll also catch glimpses of marine life such as seals and sea otters. If you&apos;re lucky, you may even spot a pod of dolphins playing in the waves. As you come toward the Coast Guard Pier, the Rec Trail will pull away from the coast, taking you through the heart of Cannery Row. Once upon a time, this neighborhood was filled with sardine canneries, as immortalized in John Steinbeck&apos;s novel Cannery Row. Now it features restaurants, hotels, specialty shops, galleries and wine tasting rooms. You&apos;ve got enough time for some browsing before dinner at a Cannery Row landmark. The Sardine Factory has been a top Cannery Row dining destination since 1968, and still regularly appears on local and national "best-of" lists. Don&apos;t miss Rachael Ray&apos;s favorite, the calamari puffs, or the legendary abalone bisque. You&apos;ve planned ahead for your Monterey Bay Aquarium visit by buying tickets online and printing them at home or by purchasing a hotel package that includes two-day tickets for the price of one day. If there&apos;s a line, you&apos;ll get to skip it and head in through the special entrance for advance ticket holders. The Aquarium has enough extraordinary exhibits to fill an entire day. For a quick tour, start with the million-gallon Open Sea Exhibit and other special exhibitions. Then cross over the bridge to the Ocean&apos;s Edge Galleries and swing by the Kelp Forest exhibit and (if little ones are in tow) the Splash Zone. Head downstairs for the Monterey Bay Habitats exhibit and interactive Touch Pool. Enjoy a clear-conscience sustainable seafood lunch just a block away from the Aquarium at the Fish Hopper restaurant. The Fish Hopper, located in an original sardine cannery building, earns raves both for its clam chowder and for its stunning Monterey Bay views. Point Lobos State Natural Reserve has been called "the greatest meeting of land and sea in the world." Hikers regularly spend entire days here. Catch a glimpse of what has captivated so many photographers, artists and writers by taking the short, easy Sea Lion Point trail down around Sea Lion Cove. If you have time and the inclination, continue your tour with a walk on the Cypress Grove trail. Tonight you&apos;ll dine at AAA four-diamond award winning restaurant Pacific&apos;s Edge at the Hyatt Carmel Highlands, called one of the top 20 restaurants in the United States by Wine Spectator. Perched on a hill above the Pacific Ocean, Pacific&apos;s Edge offers stunning views of the Carmel coastline. Watch the sun set as you dine. Carmel-by-the-Sea is one of the top shopping destinations in the United States, but one with deep bohemian roots. Spend your morning exploring chic boutiques along Ocean Avenue, anchored by tony shopping center Carmel Plaza. Your delicious lunch today is from one of Carmel-by-the-Sea&apos;s longtime top restaurants, Anton & Michel. Whether it&apos;s surf or turf you enjoy, this restaurant, loaded with old-world charm, is sure to please your palate. Monterey County is one of California&apos;s primary viticultural regions, yet it&apos;s still under the radar for many oenophiles. Because of the county&apos;s unusual geography and climate, it has a phenomenal nine American Viticultural Areas within its borders. From Carmel, it&apos;s a quick drive out on Carmel Valley Road to Carmel Valley Village, home of several wine tasting rooms all within walking distance of each other. For the adventurous, follow the very scenic Carmel Valley Road out to Arroyo Seco Road and River Road in Salinas Valley for another ten wine tasting rooms. Lucia Restaurant & Bar, located at Bernardus Lodge in Carmel Valley, has racked up an impressive slate of awards over the past decade. It&apos;s a fitting location for your last Monterey County dinner of this trip. Rather than ordering a la carte, leave your palate&apos;s fate in the hands of Chef Cal Stamenov and his tasting menu for seven courses that are sure to delight.